The selling tools discussed in this blog series (cross-sell, upsell, and substitution) can help any business, be it B-to-C or B-to-B, increase average order size, create customer loyalty, and save sales that might otherwise be lost. The statistics bear out that cross-sell, upsell and substitution capabilities are amongst the most important features an eCommerce system can offer – giving both small businesses and customers the options, functionality, flexibility and shopping experience that was previously reserved for the large eCommerce players. Dydacomp’s SiteLINK eCommerce, along with the company’s Multichannel Order Manager business automation solution, offers robust selling tools as well as the ability to utilize real-time data to populate the available offers (e.g. : “Customers Also Bought”) as well as to manually select items shown. To learn more about Dydacomp multichannel business solutions, visit http://www.dydacomp.com or click one of the buttons below. 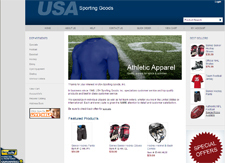 This entry was posted on Thursday, August 2nd, 2012 at 12:01 pm	and is filed under Ecommerce. You can follow any responses to this entry through the RSS 2.0 feed. You can skip to the end and leave a response. Pinging is currently not allowed.